Reflexively, or on cue, I looked up at the muted television screen and immediately realized why. I was turning up the volume just as Leonard softly growled, "Everybody knows that the war is over... everybody knows that the good guys lost..." Just in time to watch George Bush Jr. have another Historical Moment. The sound of the two men's voices filled the room, seemed to rise up at each other, then fall back, and then surge forward again like a tide. They faced off from opposite ends of an ideology. Standing there, at the center of it, I felt my mind reel for a moment; then, the song ended. Bush blessed the nation and let loose the journalists of war... and Larry King took point. To absolutely no one's surprise, the events that have been gaining momentum for six months have now come down to 48 hours and a declaration of war that no one is buying as another threat. CNN, perhaps the least surprised of all, is now back in the same business that launched them. Their correspondents are staked out all over the world's "hot spots" while local anchors deliver the news in front of giant, idiot-proof maps with 3-D imaging of the "terrain." Iraq is a solid, burnt orange mass with a star marking Baghdad near the center  incidentally, the same color as our current "Alert Level." Anyway! Happy Saint Patrick's Day and a Merry Full Moon to you all! I crossed a bridge today that I never thought I would cross, though it's always been there in front of me (sometimes in my periphery)... at times beckoning, but more often warning me to stay away... Cross this bridge, I knew, and there would be no return. I cut my own hair today. Oh, I should clarify! Not just a hair  no, no! I pretty much cut all of 'em. I didn't set out to do it. Not really. At first, it was more of a desperate cry for help/cutting my own hair than an earnest attempt to actually cut my own hair. This all started several months ago when I began coloring my hair with the kind of peroxide you buy at the drug store for around $3.50 and mix yourself (let's call it the "bleach" bridge). After that, walking into a trendy salon with a full head of hair that screamed "Do It Yourself" and asking them to take a little off the ends just didn't seem right. I knew that a salon appointment would mean enduring the snide remarks of a strange stylist and the condemnation implicit in each pass of her comb through my frayed, strawlike ends  the same way you know, when you get that Maori knotwork inked across your forehead, that you're essentially forfeiting any political career plans you may have had. 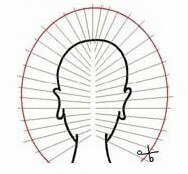 I started gathering information about cutting hair to educate Mr. Pink, who was, after all, doing an exemplary job with the bleaching and had, after all, been practicing on his own head since before I has allowed to color my hair. I found a few useful articles (some with illustrations!) and I studied them, waiting for the day when we would both feel up to the endurance test that such an undertaking would certainly amount to. Predictably, the day my patience ran out, Mr. Pink was thoroughly engaged elsewhere (well, in the living room... but thoroughly). So, I cleared the floor in the bathroom and propped a hand mirror up on the towel bar for the rear-view. For a long time I just stood facing my reflection with my barber shears and three different combs in hand parting and reparting my hair into sections, surveying the bleach-ravaged terrain. And then I started cutting. Once you start, at least if you're me, there's no turning back. There would be no shameful emergence from the bathroom, no tearful requests for assistance with towel-shrouded head bowed in defeat. It was just like teaching yourself to roller skate... or apply liquid liner... or something that will drastically and irreversibly alter your appearance in the one area of your body that everyone sees, for which you've had no training or experience, the results of which you'll have to live with for the next six months  if you're lucky. You know that feeling when you're in a new stylist's chair for the first time and you don't know each other yet? There's always that one moment when something she says plants the seed of doubt that you and she might have radically different definitions for some very basic terms... like "inch"... or "body." ...and if it goes horribly, catastrophically wrong, you will take it as a sign that it's finally time for you to see what you look like with that cool, surfer-girl pixie cut. Change is good. Right? Yeah, you know that moment. Anyway, when you cut your own hair, it's nothing but that moment, juxtaposed against your "stylist" persona who is, of course, powerless to reassure you because  she's YOU and she's never done this before and everyone, I mean everyone knows it's a terrible, daft idea to attempt to cut one's own hair. But I was lucky. I must have, like, an extraordinary sense of proportion or superior hand-eye coordination or something because the end result does not scream "Did it Myself." And I wasn't careful or conservative at all; I dove in and somehow managed to wrestle my hair back from the Valley of the Dolls (the Barbie that your dog used to drag under the porch and chew on, for example). It looks healthy and shiny... and it feels like I actually got a haircut. I'm so pleased... but let me make this clear; I do NOT recommend this to anyone! Our thanks to Brady & Clyde for this one... Meankitty.com is one of the funniest things I've seen in a while... it's even funnier than the feline community's answer to "Are You Hot" (which is still pretty funny). From cats to rats... I must be dealing from a half deck today. Oh well. Anyway, I've been seeing a lot of previews lately for "Willard," Crispin Glover's new film of vermin and vengeance. It's about a guy who makes friends, and eventually an army, out of hundreds of rats living in his basement. All I can think is that this is the story of a Batman villain who jumped franchise and got to star in his own movie. If you've been complaining that "Fear Factor" just isn't long enough or vicious enough, this movie was made for you. On Thursday, February 27, former US Diplomat John Brady Kiesling submitted his resignation to Sec. of State Colin Powell and the letter was made public by The New York Times. Highlights: "Until this Administration it had been possible to believe that by upholding the policies of my president I was also upholding the interests of the American people and the world. I believe it no longer... I am resigning because I have tried and failed to reconcile my conscience with my ability to represent the current US Administration." The letter is well worth reading in its entirety. For those of you interested in an astrological perspective on the problem of our current administration, I refer you, as always, to Eric Francis. Last but not least... oh my god, oh my god, oh my god, I am so happy that someone (Alice, je t'adore!) found this! For those of you who don't (or, for some tragic reason, can't) watch The Daily Show with Jon Stewart, or for anyone who missed this when he played it the first nine times, I give you... The President, at his finest.